~ by Expatriate Games on August 12, 2010. Great job capturing the smoke, I’m afraid I don’t have nearly your ability. I just did a post on a temple, and your post has made me wish I had a bit more skill with a camera. Just read your post Fabalicious (really – Fabalicious? ), looks like a good trip. Where are you right now, China or NY? Best of luck to the “kids” and the arrival of your grandchild. Our recent delivery experience was 23 hours long, I’m sure you’ll hear from them soon. Is that Man Mo? I went there once but had the wrong lens for the job so I’d definitely like to go back! If it’s a different place that’s cool too. I know why I’m awake at 4:39 in the AM and I suspect your being awake has something to do with Reilly?! Yes, Man Mo Temple, a fave of mine. Reilly is partially responsible for my being online at this time, although I’m usually up around 5. Don’t know how you do it, even with ample light you get your pictures nice and sharp. Hoping for an easy delivery and a healthy grandchild! OK, so maybe some aren’t so subtle. Have you been to XiLai Temple on the riverside. They leave you alone there and have no objections to photographs. It’s also small, but better maintained and attractive. I have Ken and yeah it’s much more photg friendly and comfortable. I’m actually thinking about going back this week or next, I’ve learned a few tricks since last time I was there 3 years ago. You up for dropping back in there? Yeah. Sure. I’ve been a hundred times, but it is always worth another look. They are having one of their special days on Tuesday the 24th (15th by lunar calendar) if you fancy an early morning visit. Ah, I’ll be out of town then, I need to go maybe next week. Hey, nice work. 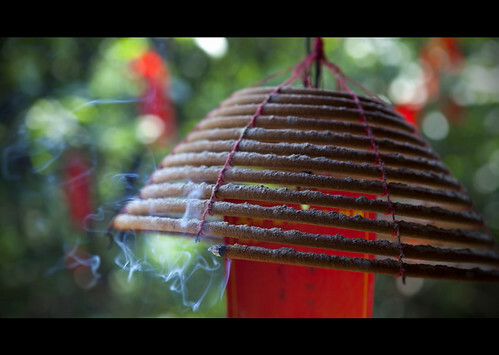 Love the way you captured the incense. especially the shot from below. Where are you in China actually? Hey thanks for dropping in, I’m in Liuzhou in Guangxi Province. I’ll get over to your blog here soon and check out what you’ve been up to. I just got back from Shanghai attending the expo 2010, crowded to say the least. Will you be there on the long term? Year four and counting… I think I’m probably here for a while yet! I travel up to China quite often these days… I’ll drop you a message if I’m around Guangxi Province. Maybe we can meetup for a photo-outing or something. Always like to meet a fellow photographer and blogger. Yeah do let me know… I’d actually love to come to Malaysia someday too. Hopefully we’ll get the chance to meet up. Sure. Just drop me a mail if you decide to visit. I’ll look forward to it. Such glorious photographs, and the colors are amazing!! Congrats on the Canon 5D – the 2 of you make a perfect pair. Love your blog, and I’m happy that you’re up and around again. Peace. Roger nice to see you… I need to get over to see what you’ve been up to!